Do you love winter – toasting by an open fire, skiing and snow, slow cooking and red wines? Or are you hanging out for the first blossoms to appear? Right now, we're enjoying the lengthening days and a bit more sunshine, especially doing the pruning! It won't be long before buds appear on our fruit trees and vines, and there's still heaps to do. In the world of Australian wine we've been reading about the latest Penfolds releases, with 2010 being described as their best vintage ever. We don't have any to share with you right now, but we do have six half-cases of deep, rich shiraz from Heathcote in central Victoria to offer, and lots more wine and more in our monthly competitions; check them out in the column on the right hand side of this newsletter. You'll also find our featured tasting notes there, with wines from Western and South Australia, plus some new beers – just scroll down a bit and you'll find them on the right hand side, too. Meanwhile, settle back and enjoy the first of our two August newsletters, and if you're not at work, pour yourself a glass of your fave red or winter white (a good rich chardonnay or semillon blend, perhaps?) to wash it down with. There are loads of events in wine and food country coming up below, ideas for Fathers' Day, and lots more to enjoy. Cheers! Some of our subscribers have made a confession – they're also into craft beers (and whiskies!). If you're one of them (and I certainly enjoy the odd stout and dark ale in winter), find out what's happening in the new brewing scene in South Australia's McLaren Vale. Or if wine remains your number one, this month we're going back to basics with Jancis Robinson MW OBE, as she takes us through the qualities of three significant grape varieties. Distinguished wine writer Jancis Robinson MW OBE tells us all about some of our most popular grape varieties, including which wine regions in the world produce the very best. Drivers around Tasmania are often struck by the views, especially the magnificent lookout from Cherry Tree Hill on the East Coast, over Moulting Lagoon to the granite mountains of the Freycinet Peninsula behind Coles Bay. In the foregound is Coombend Vineyard, purchased by Brown Brothers as part of their cool climate wine expansion. Visiting Cowra and Canowinda in Central NSW? Here's an itinerary for a weekend or midweek overnight stay. Or would you like to meet the menagerie at Leura Park Estate in Victoria's Bellarine Peninsula, west of Melbourne? Yes, it's red wine time – big, rich reds. The famous Coonawarra wineries will once again showcase their wares across the country in August. Event organisers and marketers, don't forget you can list your food and wine events on our calendar FREE. Simply go to VisitVineyards.com/MyAccount and enter your event details. Gisborne Peak Winery Eco-Cottages (Vic): just 45 minutes from Melbourne, you'll find a warm friendly welcome at both the cellar door and cottages. Kick off your shoes, unpack your bag then take a seat on your private balcony overlooking the vineyard. Take a breath and become part of the landscape with its Australian gardens and the lake. 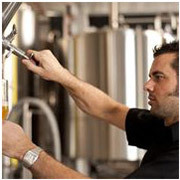 Hargreaves Hill Brewing Company (Vic) is a family owned and operated microbrewery and restaurant in the Yarra Valley. Amongst their brews are an ESB, hefeweizen, pilsner, pale ale, Abbey Dubbel and a very special Russian Imperial Stout. Why not buy Dad a VisitVineyards.com Membership, that will last him a year long? It's only A$39 (or A$59 for a couple) and there are over 200 benefits for him (or you!) to enjoy. We can post him (or you) a gift membership in a lovely lime green gift card, in time for Father's Day. Just email Kerry (or phone her on 03 6248 4476) and she will take care of it for you. All recipients of this newsletter are eligible for these generous offers. Do you love walking? Then Food to Go by Frank Wall, Sue Wall and Deb Hadskis is a real find. With it, you can take your campfire cooking to a level well beyond two minute noodles, macaroni cheese and dehydrated peas. With ideas, menus, recipes and tips from experienced walkers from across the world, you can now add gourmet to your cooking, whether camping, hiking or just enjoying a day outdoors. The Champagne Guide 2012-2013 by Tyson Stelzer is the most up to date guide on the sparkling world, with all the latest releases, reviews and ratings on over 400 wines, a wealth of background wine and industry information plus a Champagne Hall of Fame. July was a bit of a writeoff for us at VisitVineyards.com with the flu and other nasties around. We haven't forgotten all our helpful survey respondents, and we'll be getting in touch with you as soon as we can. We hope that all is well with you and yours, and remember that life is short: too short to drink bad wine, to have bad experiences, to miss that great meal or festival.... so get out there any make the most of it! Our aim at VisitVineyards.com is to help you do just that. Don't forget to download our free iPhone app before you head out into wine and food country, so you'll never miss a thing. (Earn extra Brownie points and tell Dad about it, too). © Visit Vineyards® Pty Ltd and Winepros Archive 2012. All rights reserved. All images are © of their respective Copyright owners and are used with permission.